Though both cans are recommended, the PCV system is more important than the Crankcase side. The crankcase side can be added later, but you can do a test to see how much oil you are getting in your stock intake inlet tube. Pull the hose off the back of the intake and stick your finger inside to see how much oil is in the tube. If you get a drop on your finger it is recommended to add the Crankcase system as well. If you get just a small amount/residue/smudge on your finger you are good. 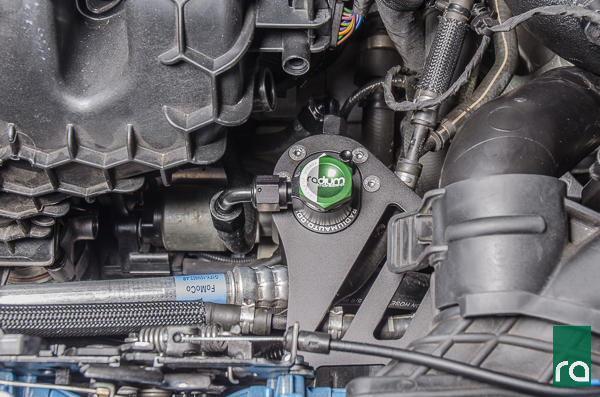 The 20-0315 PCV Catch Can Kit, Ford Focus is used in both the ST and RS models with the EcoBoost engine. It mounts on the front left bulkhead, as shown below. The 20-0316 Crankcase Catch Can Kit, Ford Focus mounts on the high pressure fuel pump (HPFP) in the back left of the engine bay, as shown below. Because the ST uses a different HPFP than the RS, this kit is only compatible with the RS model. 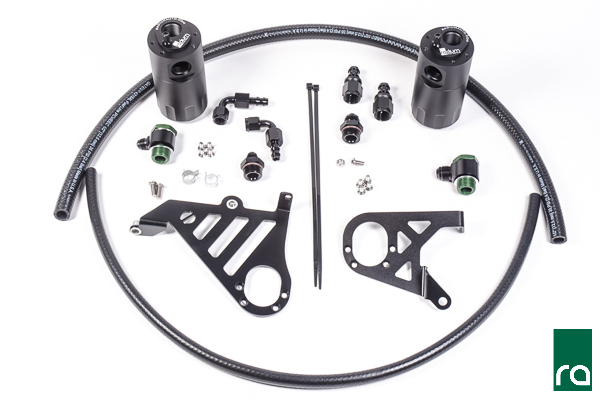 This kit utilizes both the "Crankcase" and "PCV" catch can kits, as shown below.